Gently used and sounds good! Purchased within the past year. Couple scratches near the nut because of trouble opening the truss rod latch. Truss rod patch can be opened by unscrewing the screws. Trending at $165.98eBay determines this price through a machine learned model of the product's sale prices within the last 90 days. Ibanez GSRM20 Mikro Short-Scale Bass Guitar Features If it's because you need a smaller bass for the tour bus or running scales in cramped quarters, we can. Ibanez Mikro Electric Guitars are incredibly crafted musical machines where only the physical size is small, not the sound! With a short scale neck, the GSRM20 is perfect for anyone who needs a compact axe or the comfort of a smaller neck. Playing bass is more fun than ever with the Ibanez GSRM20 Mikro Electric Bass Guitar. 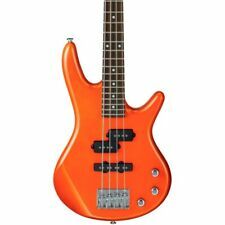 The Ibanez GSRM20BKL Mikro bass is the left hand version of the GSRM20 electric bass. It features a shorter neck and smaller body than a full size bass. The Mikro bass is perfect for last minute rehearsals, students, young rockers just joining the fray or anywhere space is at a premium. Having trouble fitting in?. If it's because you need a smaller bass for the tour bus or running scales in cramped quarters, we can. If you’re not satisfied, neither are we. It’s that simple. Neck: GRSM 4, 28.6". Ibanez GSRM20B miKro Bass Guitar - Weathered Black - QTY 1. Ibanez IBBMIKRO Gig Bag for Mikro Series Bass Guitars - QTY 1. Ibanez junior sized 4-string bass guitar in weathered black finish. This basic strap is a great match for any acoustic guitar, electric guitar, or bass guitar. Ibanez GSRM20BWK Gio 4-String Mikro Weathered Black Bass Guitar Bundle! Ibanez GSRM20BWK GIO MiKro 4-String Bass Guitar Bundle. Small hands make big sounds with the Ibanez miKros. These compact guitars have many of the features of their bigger counterparts. Having trouble fitting in?. 4.5 out of 5 stars - Ibanez GSRM20BWK Gio 4-String Mikro Weathered Black Bass Guitar Bundle! 4 product ratings4 product ratings - Ibanez GSRM20BWK Gio 4-String Mikro Weathered Black Bass Guitar Bundle! Ibanez GSRM20B miKro Bass Guitar - Walnut Flat - QTY 1. Ibanez IBBMIKRO Gig Bag for Mikro Series Bass Guitars - QTY 1. Ibanez junior sized 4-string bass guitar in walnut flat finish. This basic strap is a great match for any acoustic guitar, electric guitar, or bass guitar. Ibanez GSRM20BK Mikro Electric Bass Guitar, Black. Condition is New. Shipped with USPS Priority Mail. Small hands make big sounds with the Ibanez miKros. These compact guitars have many of the features of their bigger counterparts. Ibanez GSRM20BS MiKro 4-String Electric Bass Guitar Bundle. MPN: GSRM20 BK. Ibanez GSRM20 miKro 4-string Bass Guitar - Black - QTY 1. Ibanez IBBMIKRO Gig Bag for Mikro Series Bass Guitars - QTY 1. Ibanez junior sized 4-string bass guitar in black finish. This basic strap is a great match for any acoustic guitar, electric guitar, or bass guitar. MPN: GSRM20 BS. Ibanez GSRM20 miKro 4-string Bass Guitar - Brown Sunburst - QTY 1. Ibanez junior sized 4-string bass guitar in brown sunburst finish. This basic strap is a great match for any acoustic guitar, electric guitar, or bass guitar. The GSRM25's 28.6" scale neck is perfect for students and smaller players. A sturdy B15 bridge is one feature on the well-equipped GSRM25 Mikro bass. Neck Type: 28.6" scale GSRM5. New Gear: If you’re not satisfied, neither are we. Having trouble fitting in?. If it's because you need a smaller bass for the tour bus or running scales in cramped quarters the Ibanez Mikro is here to help. 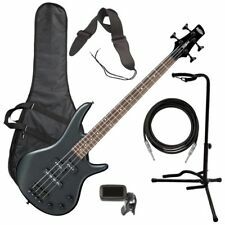 Ibanez GSR MIKRO Compact Electric Bass Guitar (Black) w/ Free Ibanez Gig Bag. The perfect size for your pint-sized rocker, this Ibanez miKro GSRM20 electric bass guitar gives you great low end with minimal size and weight. When you pick up this bass, you'll find that its compact body and smaller neck provide you with amazing comfort and playability, especially if you have shorter arms or smaller hands. Ibanez GSRM20 Mikro Short-Scale Bass! Having trouble fitting in?. If it's because you need a smaller bass for the tour bus or running scales in cramped quarters, we can. Includes Ibanez gigbag. Middle pickup: STD J bridge pickup. MPN: GSRM20 BK. Perfect for young students and players of all levels who prefer a smaller neck size and lower string tension. Compact version of the award winning, vastly popular Soundgear series. Knowledgeable and friendly Sales Advisors at the ready. Following the great success of the Mikro guitars, Ibanez has now brought Mikro basses into the fold, based on the Soundgear line. The shortened 28.6" scale is the perfect solution for smaller hands, younger players, or anywhere that space is at a premium. Ibanez GSRM25 miKro 5-string Bass Guitar - Black - QTY 1. Ibanez IBBMIKRO Gig Bag for Mikro Series Bass Guitars - QTY 1. Ibanez junior sized 5-string bass guitar in black finish. This basic strap is a great match for any acoustic guitar, electric guitar, or bass guitar. Ibanez GSRM20 Mikro Short-Scale Bass w/gigbag! Having trouble fitting in?. If it's because you need a smaller bass for the tour bus or running scales in cramped quarters, we can. Inlay: Pearl dot. Neck pickup: STD P neck pickup. Having trouble fitting in?. If it's because you need a smaller bass for the tour bus or running scales in cramped quarters, we can. Fingerboard: Rosewood. Compact and comfortable. New Gear: If you’re not satisfied, neither are we. Ibanez miKro 4-String Electric Bass Guitar - GSRM20BWNF. Small hands make big sounds with the Ibanez miKros. These compact guitars have many of the features of their bigger counterparts. USA is v110. Ibanez GSRM20L Left-Handed miKro Bass Guitar - Black - QTY 1. Ibanez IBBMIKRO Gig Bag for Mikro Series Bass Guitars - QTY 1. Ibanez left-handed junior sized 4-string bass guitar in black finish. This basic strap is a great match for any acoustic guitar, electric guitar, or bass guitar. Ibanez GSRM20 Mikro Short-Scale Bass! Having trouble fitting in?. If it's because you need a smaller bass for the tour bus or running scales in cramped quarters, we can. Middle pickup: STD J bridge pickup. MPN: GSRM20 SLB. Ibanez GSRM20 miKro 4-string Bass Guitar - Starlight Blue - QTY 1. Ibanez junior sized 4-string bass guitar in starlight blue finish. This basic strap is a great match for any acoustic guitar, electric guitar, or bass guitar. MPN: GSRM20 BK. Ibanez GSRM20 miKro 4-string Bass Guitar - Black - QTY 1. Ibanez junior sized 4-string bass guitar in black finish. This basic strap is a great match for any acoustic guitar, electric guitar, or bass guitar. Bass Guitars. Electric Guitars. 28.6" scale. For competitive pricing find Spotlight Music on the web! B10 bridge. Rosewood fretboard w/White dot inlay. Agathis body. GSRM4 Maple neck. Ibanez GSRM25 5-String MIKRO Junior Bass Guitar Black. Small hands make big sounds with the Ibanez miKros. These compact guitars have many of the features of their bigger counterparts. Small hands make big sounds with the Ibanez miKros. These compact guitars have many of the features of their bigger counterparts. Ibanez GSR Mikro Compact 4-String Electric Bass Brown Sunburst. Perfect for young students and players of all levels who prefer a smaller neck size and lower string tension. Compact version of the award winning, vastly popular Soundgear. Knowledgeable and friendly Sales Advisors at the ready. The GSRM25's 28.6" scale neck is perfect for students and smaller players. A sturdy B15 bridge is one feature on the well-equipped GSRM25 Mikro bass. Neck Type: 28.6" scale GSRM5. If you’re not satisfied, neither are we. Having trouble fitting in?. If it's because you need a smaller bass for the tour bus or running scales in cramped quarters, we can. Brown Sunburst Rosewood fretboard. Fingerboard: Rosewood. If you’re not satisfied, neither are we. Ibanez GSRM20B 4-string Mikro Short Scale Electric Bass - Walnut Flat, New! Ibanez GSRM20B Walnut Flat. 4-string Mikro Short Scale Electric Bass. Small hands make big sounds with the Ibanez miKros. These compact guitars have many of the features of their bigger counterparts. 5 out of 5 stars - Ibanez GSRM20B 4-string Mikro Short Scale Electric Bass - Walnut Flat, New! 6 product ratings6 product ratings - Ibanez GSRM20B 4-string Mikro Short Scale Electric Bass - Walnut Flat, New! Having trouble fitting in?. If it's because you need a smaller bass for the tour bus or running scales in cramped quarters, we can. Fingerboard: Rosewood. New Gear: If you’re not satisfied, neither are we. MPN: GSRM20 RBM. This basic strap is a great match for any acoustic guitar, electric guitar, or bass guitar. Kraft Music Clip-On Electronic Tuner - QTY 1. What's included in this bundle Our service doesn't end with the sale either. Having trouble fitting in?. If it's because you need a smaller bass for the tour bus or running scales in cramped quarters the Ibanez Mikro is here to help. Ibanez GSR Mikro Compact 4-String Electric Bass Black. Small hands make big sounds with the Ibanez miKros. These compact guitars have many of the features of their bigger counterparts. bridge B10 bridge (19mm string spacing). Scale : 726mm/28.6". hardware color Black. Having trouble fitting in?. If it's because you need a smaller bass for the tour bus or running scales in cramped quarters, we can. Transparent Red Rosewood. Fingerboard: Rosewood. If you’re not satisfied, neither are we.